Despite being well-aware of the importance of good nutrition and the impact of diet in the treatment of cancer patients, it was during a placement with the oncology department immediately after completing her Masters degree, that Jenelle Loeliger realised she wanted a career in oncology nutrition. “It was oncology that provided the greatest ‘spark’ for me,” says Ms Loeliger, an Advance Accredited Practicing Dietitian, and Interim Director of Allied Health at Peter MacCallam Cancer Centre. “It was an area that enabled me to get to know my patients - rather than seeing them once or twice in an inpatient setting, work alongside them to produce positive dietary changes that helped them during an extremely difficult time in their life and play a key role in cancer care within the multidisciplinary team. Over the years, Ms Loeliger’s focus has broadened from individualised work with patients to taking on a management role within the Peter MacCallam Cancer Centre, which has a dedicated arm for oncology nutrition and diet, a reflection of the growing importance of this area. “Peter Mac has a team of dietitians and nutrition assistants who provide assistance and support to patients of all cancer types going through all types of treatment. “Patients may be seen in the inpatient wards, in outpatient clinics - including in radiotherapy, and in the chemotherapy day unit. “Our dietitians specialise in nutrition and oncology of particular cancer types so our patients receive specialised, tailored and evidence-based advice. While it is well recognised that nutrition is a key component in optimal cancer care, exactly what role it plays varies depending on cancer type and progression. While nutrition is well understood as an important aspect to consider in cancer care, Ms Loeliger says the type of nutrition advice required at different timepoints in the cancer trajectory is less well understood. “For example, before, during and immediately after treatment, patients should focus on optimising their protein intake and ensuring they maintain their weight and muscle mass, regardless of size – however this is often a time when patients believe they must change their diet to be ‘healthier’ by reducing fat and sugar or eating more fruit and vegetables. “Advice for patients who have completed treatment and no longer have symptoms, a focus on eating a traditionally ‘healthy’ diet is typically the goal. “For clinicians working in oncology, the importance of nutrition and awareness of issues such as malnutrition are known, however consensus on who/how to identify it and who/how it should be managed is inconsistent in practice. “Good nutrition for cancer patients is everyone’s responsibility however dietitians play a central role in ensuring our practice and systems are evidenced-based and enable the best outcomes for patients. Ms Loeliger says it’s common for those with cancer to experience significant problems with eating as a result of the cancer itself or from the effects of treatment. 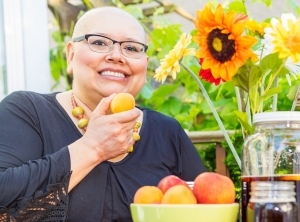 “We know that poor nutrition or malnutrition for those undergoing cancer treatment can have dire consequences such as reduced survival, increased treatment toxicities and poorer physical function. While Ms Loeliger’s early days in oncology nutrition were more hands on, these days, her role involves a lot of big-picture tasks, such as supporting staff, writing and reviewing, and advocating within the hospital and with other agencies for better care and services – all in an attempt to enable her team to deliver quality care to people with cancer. “My early career years as a dietitian working one to one with patients were so rewarding – preventing patients being admitted to hospital for their treatment with appropriate dietary advice, optimising their physical state to avoid needing a feeding tube and getting to know and see patients who had undergone complex treatment to become fit, well and cancer-free following treatment. For qualified dietitians, there is no specific training to work in oncology nutrition however there are multiple professional development events and networks available for participation. “On the job specialisation in a cancer centre or hospital treating cancer patients is how you would get involved in oncology nutrition specifically,” says Ms Loeliger.